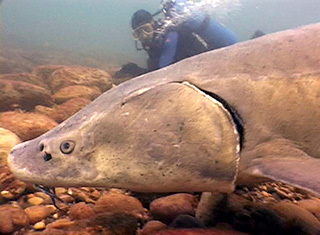 The lake sturgeon, Acipenser fulvescens, one of four freshwater sturgeon in North America, is the largest fish and the only sturgeon found in the Great Lakes. 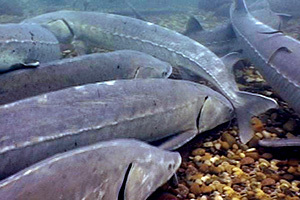 Lake sturgeon are bottom feeders, eating a variety of small animals and fish. Geological records indicate that the lake sturgeon we see today are virtually unchanged from fossil lake sturgeon from over 100 million years ago. The Detroit River, Lake St. Clair, and the St. Clair River support the largest remaining population of free-ranging lake sturgeon. Of the many historically known spawning sites, only two are known to be active, and both are in the St. Clair River. From 1900 to the 1970s, little is known about lake sturgeon populations, except for their continued decline. Today, the state of Michigan prohibits commercial fishing for lake sturgeon and closely regulates sturgeon sport fishing. 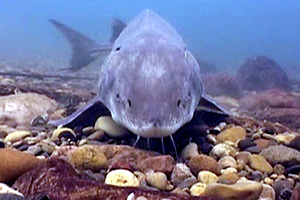 While fishing exploitation removed millions of lake sturgeon, habitat alteration and degradation destroyed traditional spawning grounds. As a result of these declines, lake sturgeon are recognized as threatened in North America and listed as Endangered, Threatened, or Special Concern in 19 of 20 states throughout its range. Restoration efforts today involve creating and protecting sturgeon habitat to enhance spawning success. Many fish seek out rocky areas in fast-flowing currents in order to deposit their eggs during spawning season. Unfortunately, many of the natural limestone reefs and rocky areas were destroyed in the Detroit and St. Clair rivers when shipping channels were constructed. Similar spawning areas in tributary rivers were made inaccessible as a result of dams. 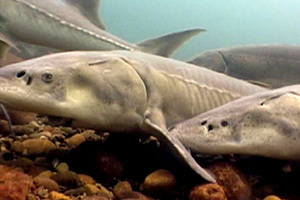 Despite massive population declines, the waterways connecting Lakes Huron and Erie continue to support the largest remaining population of lake sturgeon in the Great Lakes. In 1985, the U.S. and Canadian governments identified the St. Clair River as one of forty-three Areas of Concern across the Great Lakes because it has the most significant pollution problems and greatest loss of beneficial uses for the public. All Great Lakes and their connecting waterways have fourteen Beneficial Uses that are protected by both the U.S. and Canadian governments. By 1992, the St. Clair River Binational Public Advisory Council had determined that there were ten Beneficial Uses that were impaired on the St. Clair River. These Beneficial Use Impairments were due to municipal and industrial discharges, combined sewer overflows, contaminated sediments, destruction of fish and wildlife habitat, and polluted storm water runoff. Through two decades of collaborative efforts by government, industry, the public, and environmental groups, the St. Clair River has removed more beneficial use impairments than any other Area of Concern in Michigan. In 2010, over $6 million in federal funds was received by local municipalities along the St. Clair River to acquire shoreline property and restore these properties for wildlife habitat. In 2013, the St. Clair River is slated to receive an additional $6 million to complete habitat projects that will allow for redesignation of the Fish and Wildlife Habitat Beneficial Use Impairment. Use this interactive map to find and learn about locally funded Great Lakes Restoration Initiative projects. The Great Lakes Restoration Initiative is well underway in Michigan, with more than $163 million coming into the state to implement 364 local and on‐the ground restoration projects. Begun in 2009, the Initiative builds on years of work to identify solutions to key problems facing the Great Lakes. Combined with support from events like our Sturgeon Festival, this partnership is generating on‐the‐ground actions that will improve St. Clair County’s economy, environment and quality of life. Cleaning up the Great Lakes isn’t just about correcting mistakes of the past but of leveraging a vital resource to build a better future. These projects will help delist the St. Clair River as an Area of Concern and help rebuild native fish communities throughout our region.